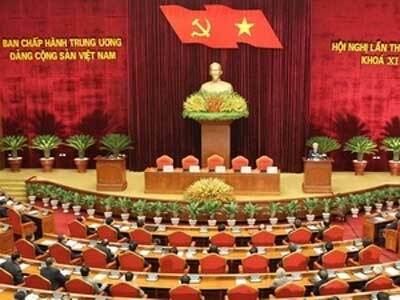 VietNamNet Bridge – The sixth plenum of the Party Central Committee wrapped up in Hanoi on October 15. During the 15-day meeting, committee members and other participants manifested a high sense of responsibility, promoted democracy and wisdom, and contributed wholehearted and profound ideas to reports and projects. The Politburo took note of those comments at the maximum level and gave explanations on issues which still see different viewpoints. The meeting discussed and reached a high unanimity on many important guidelines and policies in the fields of socio-economics, education-training, science-technology, and Party building. It decided to re-establish the Party Central Committee’s Economic Commission. The committee held for the first time a Q&A session in a democratic, frank and constructive atmosphere. Speaking at the closing ceremony, on behalf of the Politburo, General Secretary Nguyen Phu Trong clarified some issues and summarised important results. According to the Party leader, on the socio-economic situation in 2012 and orientations and tasks for 2013, the meeting agreed that despite numerous difficulties and challenges, the country’s socio-economic situation in the first nine months of the year saw certain changes. However, the pressure of inflation and macro instabilities remains great. In the coming time, the world economy in particular and the international situation in general are forecast to see unpredictable developments. Therefore, in the remaining months of 2012 and the next year, it is necessary to continue strengthening efforts to stabilise and make the macro economy healthy; pay special attention to stability, healthiness and safety of the finance-banking system; boost thrift practice; and fight corruption and waste in investment and public spending. The investment and business environment must be improved, bad debts solved, difficulties eased for businesses, domestic investment encouraged while foreign investment attraction boosted and investment in agricultural and tourism development prioritised. The meeting emphasised the need to speed up the implementation of the three strategic breakthroughs in combination with renovating the growth model and restructuring the economy, ensure socio-political stability, and create stronger foundations for development in the following years. The restructuring of public investment, State-owned enterprises (SOEs) and especially the system of commercial banks must be placed in a panorama and closely combined with the restructuring of the economy, investment and the financial market in general. On the restructuring and renovation of the SOEs as well as the improvement of their efficiency, the committee continued to affirm their core role and important achievements, and at the same time pointed out their weak points. It urged for the continued grasping and serious implementation of the Resolution of the 11th National Party Congress as well as the resolutions and conclusions of the committee on this issue in line with the context of the socialist-oriented market economy and the country’s deeper international integration. Resolute adjustments must be made so that the SOEs can have appropriate structures and take the lead in the scientific and technological renovation and application and maintaining the socialist orientation of the economy. It is necessary to put an early end to non-core investment and complete the withdrawal of the State capital at businesses holding less than 50 percent of State capital as well as urgently complete the SOEs management mechanism. The SOEs must be reorganised in the model of joint stock and limited liability companies in accordance with the Enterprise Law. The country should apply an advanced administration system suitable to the market economy and implement a close, open and transparent audit, inspection and supervision system on the basis of expanding the groups of companies eligible to list on the stock market. Businesses’ functions of regulating the macro economy and ensuring social security must be renovated and replaced by the mechanism of orders placed by the State, in accordance with the market mechanism. Major State economic corporations and groups must be restructured in the model of parent-subsidiary companies and audited annually. The pilot stage of forming State economic groups should be ended and the transformation of economic groups into corporations considered. Regarding the land issues, the committee agreed to issue a Resolution to lead and direct the amending and supplementing the 2003 Land Law, meeting the requirement of the new situation, further effectively mobilising and using land resources for socio-economic development. Shortcomings, weaknesses and negative phenomena in the field of land must be solved, especially speculations, wastefulness, corruption, disputes and lawsuits must be solved, thus ensuring the harmonious interests of the State, land users and investors, contributing to the socio-political stability. As for education and training, the committee gave opinions on a project to basically and comprehensively reform education and training, so as to meet the demand of industrialisation and modernisation in the context of the socialist-oriented market economy and global integration. Trong underlined that the committee asks for the renewal of perception and way of thinking, goals of training, organisational system, forms of education and training, contents and methods of teaching and studying, operation and management mechanisms. A contingent of teachers, managerial officials, facilities and resources must be built to ensure the renewal of the whole education system. The committee also affirmed that science and technology development is the top national policy and an important driving force in the industrialisation and modernisation. Human resources in science and technology are an invaluable asset of the country. Intellectuals in science and technology are an extremely important resource for developing the knowledge-based economy. Investment in human resources for science and technology and offers of incentives to the talents are for sustainable development. The Party and State are responsible for working out special policies for developing and bringing into full play creativeness of science and technology staff, making science and technology a key driving force and a direct production force, helping Vietnam become a modern industrialised country by 2020 and a socialist-oriented modern industrialised nation by the middle of the 21st century. About personnel planning for the Party Central Committee, the Politburo, the Secretariat and key State and Party leadership titles, Trong said it is the first time the committee discussed and issued a Resolution on this matter. The planning for strategic-level officials must stem from political requirements and tasks, the Party building, national construction and defence during the industrialisation and modernisation. Trong also stressed the need to actively and promptly discover those with promising leadership skills, while attention is paid to those originating from workers, farmers and intellectuals, increase the rate of young, female and ethnic minority officials, relatives of families that rendered great services to the revolution, and those working in science, technology, culture and art. The building and implementing of the personnel planning must be placed under the concentrated and concerted leadership of the Party Central Committee, the Politburo and the Secretariat; ensuring the principles of democracy, fairness, transparency and objectiveness. The planning must be taken as a basis for the personnel planning for the Central Committee at the National Party Congress. Those included in the planning must satisfy criteria and conditions. The committee must include three age groups to ensure continuousness, inheritance and development, and a suitable structure to ensure a comprehensive leadership. The committee also highly valued the Politburo and Secretariat’s serious, responsible and exemplary preparations and implementation of criticism and self-criticism. After over two months of preparations, the Politburo and the Secretariat spent 21 days on criticism and self-criticism, considering it as an extremely important political activity for the transparency and strength of the Party, the committee, the Politburo and the Secretariat. Each Politburo and Secretariat member has thoroughly grasped the leading guidelines of ensuring the principles, strengthening solidarity and comradeship, strictly dealing with cases of shortcomings and violations, and helping each other progress. The contents of criticism and self-criticism closely followed the requirements of the Resolution of the committee’s 4th meeting. Outstanding and pressing issues were brought to analysis and many lessons drawn. Criticism and self-criticism were implemented in a democratic, straightforward, constructive and sincere manner. The Poliburo and the Secretariat seriously self-criticised and admitted their responsibility before the committee for the shortcomings and weaknesses in Party building, degradation and negative phenomena among Party officials and members as stated in the Resolution of the committee’s 4th meeting. To seriously keep disciplines in the Party, maintain the prestige and image of the Party, and set an example in the entire Party, the whole Politburo agreed to propose the committee impose a form of discipline on it and consider discipline on a Politburo member. The committee applauded and highly valued the seriousness, exemplarity of the Politburo and the Secretariat in this criticism and self-criticism drive as well as the high determination and great efforts in leading and instructing the implementation of the Resolution of the committee’s 4th meeting. It agreed with the Politburo’s report and gave frank and profound opinions. Regarding the consideration of discipline, the committee discussed carefully and considered comprehensively all aspects at the current time and then decided to not take any discipline on the Politburo and one of its members. It asked the Politburo to apply active measures to repair shortcomings, thus preventing hostile forces from conducting acts of distortion and sabotage. The committee also conducted self-criticism and acknowledged its responsibility for failing to prevent shortcomings and weaknesses over the past time. It criticised seriously itself and apologised to the whole Party and people for those shortcomings and weaknesses, and pledged to try its best to gradually solve them. The committee urged the entire Party to uphold the sense of responsibility before the Party and the people, strengthen solidarity and unity, maintain trust, and lead the whole people to overcome difficulties and challenges, create obvious changes and repair shortcomings and weaknesses in order to build the Party purer and stronger and into a true revolutionary party that has flesh-and-blood links with the people. The Party Central Committee praised Party committees at all levels, authorities and the entire political system for seriously implementing the Resolution on Party building set out at the committee’s 4th meeting. Concluding the 5th meeting, Trong expressed thanks to Party members and people across the country for their sentiments and valuable opinions. He said he believes that thanks to the meeting’s success, solidarity and unity among Party members, as well as support from the entire Party, people and armed forces, the whole Party will successfully implement the Resolution and conclusion of the meeting, contributing to the successful implementation of the Resolution of the 11th National Party Congress.